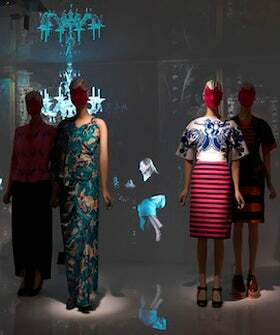 This year's Schiaparelli and Prada exhibit at the Met brought out 339,838 people. Sounds like a lot, right? Well, not if you compare it to the 661,509 visitors McQueen's "Savage Beauty" turned out just a year ago. True, the McQueen show's Mecca-like status came from the outpouring of love from fans after the designer's suicide, but all-in-all, this year's waning numbers show that the Schiap and Prada set-up just didn't click as much for the viewers. Co-curator Andrew Bolton understands, "We deliberately wanted to do something more high-concept and more intellectual than an emotional experience. We also wanted to focus on designers who are able to marry their conceptualism with practicality."